This gives you the look of a beautiful, even skin tone. 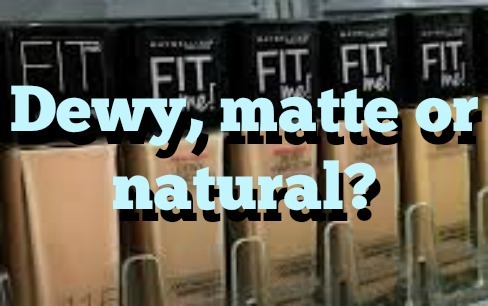 It’s not shiny or matte — it simply looks like skin. If you have normal, oily or dry skin, a natural finish is for you. Use your fingers or a damp beauty blender and press the product into the skin. Apply a thin layer to keep the makeup at a minimum. Spot-correct any problem areas with concealer. A dewy look makes the skin appear hydrated, healthy and slightly shiny. It’s not a sweaty or greasy look — instead, it’s a refreshed, glowing look that’ll keep your skin looking and feeling youthful. It’s great if you have dry, dehydrated skin, or simply love a glistening look. Prep the face with a moisturizer or primer that has hyaluronic acid, this will plump the skin and lock in moisture. Apply a hydrating foundation formula with a moist beauty blender, starting from the center of the face and working your way outwards. For extra dewiness, dab highlighter on the high points of your cheekbones. A shine-free, powdery finish that looks flawless in pictures, but in real life it can look fake and unnatural. Although it doesn’t look very natural — it’s great in pictures or for a special formal type event. Oily skin pairs perfectly with matte foundation. The foundation will absorb oil and decrease shine. If you’re a selfie queen, go for the matte finish. Apply an oil-free moisturizer, let it dry, and use a foundation brush to apply the foundation beginning in the center of the face, and blending it outwards until it nearly disappears.